We’ve been on a check with Dori’s ear, it’s been only a week we’ve got out of the hospital, it feels much longer to me, though. She’s, alhamdulilah, healthy again and fine, we just gotta keep an eye on the ear for the next year and look out for any signs of reoccurring infection. One of the main problems and causes of death in Kuwait are reckless and stupidly behaving drivers on the roads; very common is that most of the drivers don’t seem to know how to drive a manual-gear car, as 90% of cars in Kuwait are on automatic shifting, and a lot of drivers just passed through the driving school without actually taking much from it. A widely spread custom is not to use any blinkers on the road and zigzag among the other cars (because you can’t just wait or drive by the speed limit, which on the speedway is at maximum of 120 km/h), so most of the people – except the driver himself or herself – don’t really know what’s coming next. That’s one of the reasons I take as a no-no for me driving in here. I don’t suppose myself as a perfect driver and I believe that I’m under the average of averages, but giving the light in a turn, letting the other cars zip properly, and simply having that common folk sense around other drivers is something I was hoping to meet in any other person behind a wheel, but perfectly lack in most of the driving peeps in here. And it really doesn’t seem to be related to the nationality. 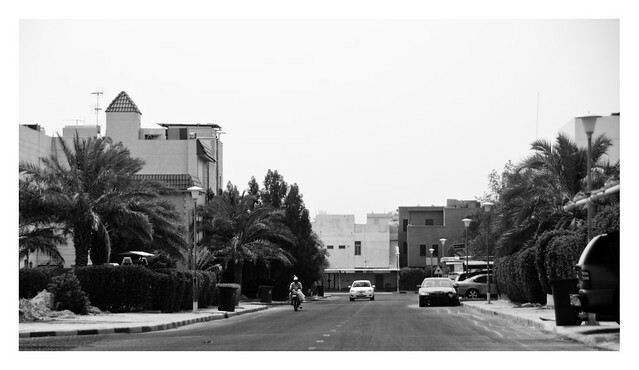 Kuwaiti, Indian, Pakistani, American, men and women, all are in the habit of being rude and idiotic towards any other traffic on the road, be it behind, in front of or next to them. I don’t even mention niqabi women whose niqab is pulled so up and tight that they have to tilt their heads backwards to even see the road in front of them, and I really can’t imagine what else they can (not) see. Hence it is not uncommon to meet many, many warning messages on the highways and ring motorways, I was even making fun of seeing so many of them – that I will start collecting their messages. Unfortunately for me I’m not usually quick enough with the camera, and today I managed to snap only two. So for now… Your family is waiting. Your children are waiting for you. 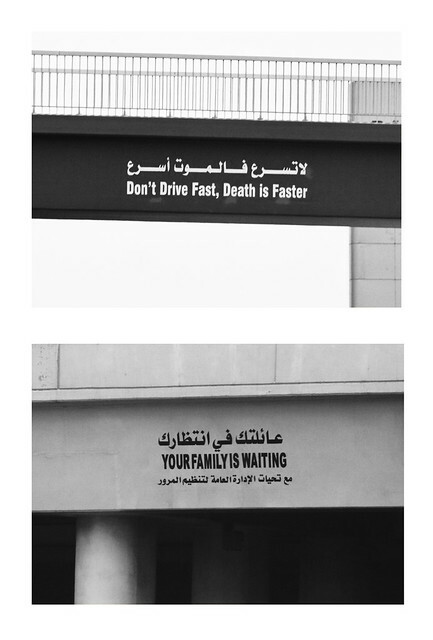 Don’t drive fast, death is faster. Speed leads to death. Punishment for speeding is prison or death. I wish the drivers would actually take them seriously. (So I could drive too, without any fear of being squashed by a Jeep trying to turn right next to me in an one-lane road. Without a blinker.). Dobrý den, mám pro Vás dotaz ohledně oblékání muslimek, pokud by Vám to připadalo nevhodné nebo urážející, pochopím, když mi neodpovíte :-) Nedávno jsem navštívila bosenské město Mostar a byla jsem překvapena, že některé muslimky chodily celé v černém až na zem, jiné měly moderní oblečení (samozřejmě ale dlouhý rukáv a kalhoty na zem) a přes hlavu šátek, záleží tedy míra zahalování ženy na jejím manželovy, popřípadě rodině? A od jakého věku se dívky zahalují?